Holger Breitenborn graduated in 2002 from the University of Applied Science in Zwickau, Germany with a Master’s degree in Industrial Engineering and Management. The main focus of his study laid not only on physics, engineering, and quality control but also on business, finance, and management. Moreover, Holger graduated from the Dresden International University in 2006 with a Master of Business Administration. 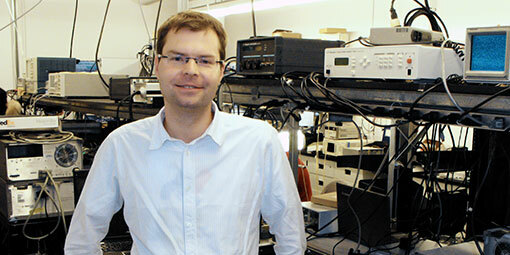 From 2007 to 2014, Holger has gained professional experience in a scientific surrounding by working as Innovation Manager at the Fraunhofer Institute for Applied Optics and Precision Engineering in Jena, Germany which conducts application-oriented research in the field of optical system engineering. During these years, he has developed a strong interest in optical technology and engineering. In May 2014, Holger joined INRS-EMT as a Master’s student under the supervision of Prof. Roberto Morandotti, and in September 2015 he switched to a PhD course. He is investigating plasmonic heating and temperature sensing in the Terahertz regime useful for thermometry and imaging technologies. In particular, his research topic is be related to domains including detection, spectroscopy and imaging and is based on the engineering and fabrication of a prototype for the photonics industry.